It began innocently enough with Banjo Emeritus Matt “French Fried Tater” Foster suggesting to his friend, Chuck that he should pick up an instrument and learn to play. 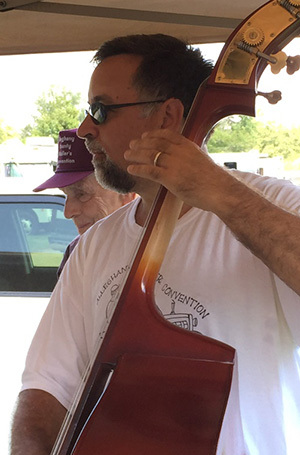 When he awoke from his dreaming, Chuck was playing bass and guitar with the Ramblers. Given he was born and raised in Nashville, it seems only fitting the feller the Kudzus nicknamed “Charles” should play music. By the way, the aforementioned Nashville is the original one, located in Nash County, east of Raleigh. When not hanging out with the Ramblers in the freezing cold bowels of Dorton Arena or unseasonably balmy Sparta, Chuck engineers buildings, bridges and trains.